Treasure hunt—All kids love treasure hunts. Now they have a fancy name: geocaching! With parent volunteers, GPS systems, and a bit of Web research, there are LOTS of great spots to geocache. You can even hide your own “treasure” in advance. Have a picnic and break up into teams. This involves tromping through parks, sometimes over mud and streams! Boy fun ALL the way. Of course, you can do it the “old fashioned” way too, with treasure maps coffee-stained to look aged, and a few holes burned in strategic spots. Rip the map into pieces so they have to find all the pieces (provide individual clues) to put together the jigsaw puzzle map, and then go find the treasure. Ice cream social—Nothing sells better than ice cream during the hot summer months! Have some crafts and games, and ice cream treats! S’mores and fun—Who can turn down a s’more? No one, of course, so expect a turnout. Have crafts and games. Shooting off water bottle rockets in a big field is also a great way to cool down on a hot summer day. Just be sure to have a water source, as once the kids get started with those rockets, it’s hard to keep up with the demand. Trailer climb—Know someone with an 18-wheeler? Boys love to climb in and all over a truck! Leatherworking/woodworking—Boys love to hit things with a hammer. If not enough activity for an event, these are great secondary activities for any other event. Be sure to send out invitations (postcards or fliers) to your target membership. Give existing Scouts an incentive to invite a friend or LOTS of friends. A patch (official recruiter patch, if appropriate), a small prize, a nominal gift card. Whatever works best with your boys and your budget. It can be one-level recognition if they bring a boy to the event and/or a second-level recognition if that boy joins the pack. Have a sign-in sheet to capture the contact information for all attendees. Have appropriate pack leadership follow up with specific invitation. Have refreshments (water, lemonade, cookies, chips, easy things). Have a secondary activity for overflow, such as a craft or game if kids get bored with the first activity or you have a big crowd and not everyone can participate at once. For example, leatherworking is popular and not something most non-Scouts have been exposed to. Have a display board with pictures of the pack having fun doing pack and den activities. Better than a display board, show a video or slide show on a laptop computer of your unit’s boys having fun. 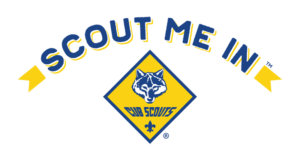 Have current Scouts in uniform or pack T-shirts! They are the best advertising, and they want to share the fun, too! Have lots of adult leaders and parents present (in uniform/pack T-shirts) to talk with the recruits’ parents. The more the merrier. People want to join a thriving organization. Join up with another nearby pack to share an event/summer activity. This doubles exposure and halves the cost. Win-win for all. * SEAL THE DEAL. It’s important to “ask” for the membership during the event. Our goal is to increase membership, and attendance at a recruiting function is the first step, but we need them to actually join. So ask! It doesn’t have to be a hard sell. But be organized and prepared ahead of time for this step. Assign people to do this; have a script they can improvise with as needed. More kids = better program and more help from new parents! The main objective is to get all units out there and recruiting.